Memory Cloud is a living sculpture that uses multimedia technology to collapse time and space in order to celebrate tradition for Texas A&M students. Composed of an ethereal network of 4,000 LED nodes, the lights flicker on and off to create an animation of silhouettes that appear as figures walking through a cloud. The winning commission was awarded to RE:site and METALAB by Texas A&M University for their new student center. The LED installation will be installed in the winter of 2012 and serve as a reminder of both the past and present. Memory Cloud is the winning design for a lighting installation in the new Memorial Student Center 12th Man Hall. Designed by RE:site (Norman Lee and Shane Allbritton, Artists) and METALAB (Andrew Vrana, Joe Meppelink and Michael Gonzales, Architecture + Fabrication), the project will hang in the atrium to create an animation of students, from the past and present, walking by. The silhouette animations are created from archived footage of time-honored traditions: the Corp of Cadets, the Texas Aggie Marching Band, Kyle Field traditions, and past graduations. Additionally, Memory Cloud can convert a real-time feed of students passing by into a ghost-like version. The sculpture is made with 4,000 energy efficient and networked LED nodes integrated within transparent tubes of various lengths suspended from a diagrid framework. This creates a vibrant, illuminated pointillist sculpture and a program controls which nodes are turned off and on and what time to display the animation. There are 12 layers or rows of lights and each can be programmed with a different sequence. Viewers can see movement from a variety of angles and see dynamic figures running, biking, or walking by in a parade of university spirit. The dreamy animations are at once vintage as well as modern and the Memory Cloud is where you can remember ghosts of the past and present. 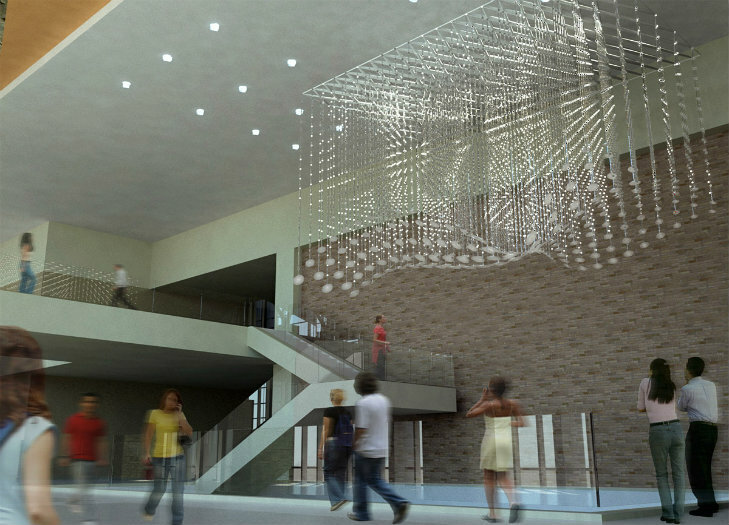 Memory Cloud is the winning design for a lighting installation in the new Memorial Student Center 12th Man Hall. Designed by RE:site (Norman Lee and Shane Allbritton, Artists) and METALAB (Andrew Vrana, Joe Meppelink and Michael Gonzales, Architecture + Fabrication), the project will hang in the atrium to create an animation of students, from the past and present, walking by. The silhouettes animations are created from archived footage of time-honored traditions: the Corp of Cadets, the Texas Aggie Marching Band, Kyle Field traditions, and past graduations. Additionally, Memory Cloud can convert a real-time feed of students passing by into a ghost-like version. The sculpture is made with 4,000 energy efficient and networked LED nodes integrated within transparent tubes of various lengths suspended from a diagrid framework. This creates a vibrant, illuminated pointillist sculpture and a program controls which nodes are turned off and on and what time to display the animation. There are 12 layers or rows of lights and each can be programmed with a different sequence. Viewers can see movement from a variety of angles and see dynamic figures running, biking, or walking by in a parade of university spirit.